Much of my research has focused on the impact of innovation and diffusion of technology on trade, competitiveness and growth, and I have published extensively on these and related topics in books and journals. 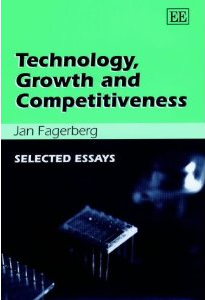 A selection of my papers in this area is published as a book (Technology, Growth and Competitiveness, Edward Elgar, 2002).You can download the list of content and introduction. The latter does not only summarize the main arguments of the book but also tells the story of how I have come to look at global dynamics in the way I do. Between 1996 and 1999 I was one of the coordinators of the large European project Technology, Economic Integration and Social Cohesion (TEIS) funded by European Commission (in which more than 50 European researchers and 15 different institutions took part). This project resulted, among other things, in the book “The economic challenge for Europe: Adapting to Innovation Based Growth” (edited by Jan Fagerberg, Paolo Guerrieri and Bart Verspagen). More recent contributions of mine on the relationships between innovation, growth and development include the articles “National Innovation systems, capabilities and economic development” in Research Policy 2008 (with Martin Srholec) and “The Competitiveness of Nations: Why Some Countries Prosper While Others Fall Behind?” in World Development 2007 (with Martin Srholec and Mark Knell). For a survey on the literature on innovation and development see Innovation and Economic Development (with Martin Srcholec and bart Verspagen), published in Hall and Rosenberg (2010): “Handbook of the Economics of Innovation”, North Holland. In 2002 I initiated the TEARI (Towards a European Area for Research and Innovation) project, the purpose of which was to produce a comprehensive overview and synthesis of the role played by innovation in modern societies. The project resulted in the publication of “The Oxford Handbook of Innovation”, coedited with David Mowery and Richard Nelson, in October 2004.The project was financially supported by the European Commission (FP5), The Norwegian Research Council and The Gulbenkian Foundation. A few years later I was chosen to head a cross-disciplinary research group focusing on “Understanding Innovation” at the Centre of Advanced Study (CAS) in Oslo (academic year 2007-2008). Around twenty scholars participated in activities of the group during that year, and many more participated in the three international workshops organized by the group, focusing on “Innovation in Firms”, “The Role of Public Sector Research in Innovation” and “Evolutionary Theory and Policy”, respectively. The two former workshops resulted in special sections in the journals Research Policy and Industrial and Corporate Change. More information on the activities of the group here. My interest for mapping the field of innovation research has led to a number of publications in recent years, see for example “Innovation Studies – the emerging structure of a new scientific field” (Research Policy, 2009, with Bart Verspagen). It also resulted in the EXPLORE project, carried out within the framework of the DIME network (financed by the European Commission), between 2009 and 2011. Results from this project, which looked not only on at innovation studies but also entrepreneurship studies and STS, appeared in a special issue of Research Policy (September 2012). Between 2003 and 2008 I was responsible for the IPP (Innovation, Path-dependency and Policy) project, financed by the Norwegian Research Council, which focused on the working of the Norwegian Innovation System from a historical and evolutionary perspective. Several researchers from the University and other research organizations in Norway and elsewhere took part. 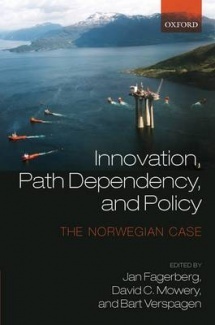 The project resulted in a book, published in 2009 by Oxford University Press, entitled “Innovation, Path Dependency and Policy: The Norwegian case” (co-edited with David Mowery and Bart Verspagen). You will find a paper summarizing some of the main findings of the project here. If you are interested in innovation policy – and read Norwegian – you may also be interested in my report “Innovasjonspolitiske Virkemidler” from 2009.